This studey tested a genetic marker that labels healthy adult neural stem cells (but not their differentiated descendents) on tumors and checked weather the marker also labels cancer stem cells in brain cancer. When they did so, they found that all tumours contained at least a few labelled cells — presumably stem cells. Tumours also contained many unlabelled cells2. The unlabelled cells could be killed with standard chemotherapy, but the tumours quickly returned. Further experiments showed that the unlabelled cells originated from labelled predecessors. When chemotherapy was paired with a genetic trick to suppress the labelled cells the tumours shrank back into “residual vestiges” that did not resemble glioblastoma. This study followed their earlier results which showed that a genetic marker that labels healthy gut stem cells also labels stem cells in benign intestinal tumours, which are precursors of cancer. In the present study a transgenic mice carrying a gene for a drug-inducible marker was used. This marker , when activated, causes labelled cells to make molecules that fluoresce one of four colours. This experiment yielded single-colour tumours consisting of several cell types, suggesting that each tumour arose from a single stem cell. This study was on skin cancer cells where individual cancer cells were labeled without targeting stemm cells specifically. The cells showed two distinct patterns of division: they either produced a handful of cells before petering out, or went on to produce many cells. 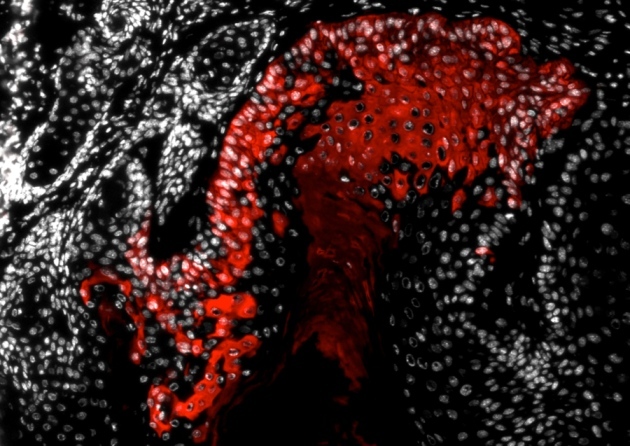 Once again, the results pointed to a distinct subset of cells as the engine of tumour growth. What’s more, as tumours became more aggressive, they were more likely to produce new stem cells — which can divide indefinitely — and less likely to produce differentiated cells, which can divide only a limited number of times. So, what is the future ?. These studies show that there are special cells called cancer stem cells which are responsible for tumor growth and not killing them specifically could be the reason for failure in cancer treatment using chemotherapy. We can expect targeted methods to kill them in the near future. Wish better success rate in cancer treatment soon. Driessens, G., Beck, B., Caauwe, A., Simons, B. D. & Blanpain, C.
Defining the mode of tumour growth by clonal analysis Nature http://dx.doi.org/10.1038/nature11344 (2012). Schepers, A. G. et al. Lineage Tracing Reveals Lgr5+ Stem Cell Activity in Mouse Intestinal Adenomas Sciencehttp://dx.doi.org/10.1126/science.1224676 (2012).